Included here are notices of lectures, conferences and other gatherings or events of Antarctic interest that appeared in 2017 and 2018 in 'Antarctic Events' but are now history. Last updated: 30 December 2018. James Caird Society AGM, Members' Evening and Lecture 23 November 2018. Dulwich College, London. 18th Annual Shackleton Autumn School 26-29 October 2018, Athy, Ireland. James Cook: The Voyages 27 April - 28 August, 2018, British Library, London. Scott 150 6 June 2018, Plymouth, Devon. 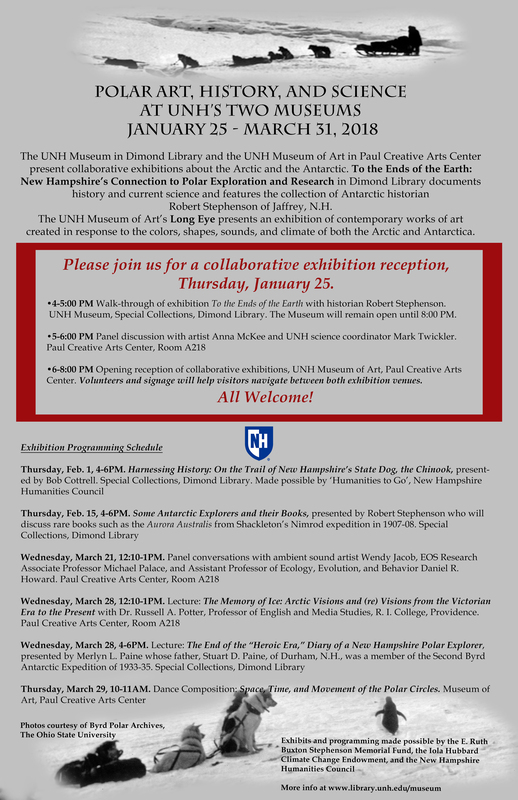 Polar Art, History, and Science at UNH's Two Museums 25 Januaray - 31 March 2018, Durham, New Hampshire. Dr Edward Wilson: From St George's to Antarctica. Talks and Exhibition 23 November 2017, London. Friends of SPRI AGM 18 November 2017, Cambridge. James Caird Society, AGM, Members' Evening and Lecture 17 November 2017, Dulwich College. 17th Annual Shackleton Autumn School 27-30 October 2017, Athy, Ireland. A Celebration of the 150th Anniversary of the Birth of William Lashly 9 September 2017. Discovery, Dundee. SouthPole-sium v.3 12-14 May 2017. Oslo, Norway. James Caird Society 5 May 2017. Dulwich College, London. Ernest Shackleton Loves Me 14 April - 11 June 2017. Tony Kiser Theatre, New York. The Heroic Era of Antarctic Exploration - A Conference 24-26 March 2017. Auckland, NZ. The Ross Sea Party Joe O'Farrell. 9 March 2017. School of Natural and Built Environment, Belfast. Songs of the Morning 5 March 2017. Bridlington, East Yorkshire. Shackleton 28 February - 11 March 2017. Blue Raincoat Theatre, Dublin. Friday, 23 November 2018, 6pm, Great Hall, Dulwich College, London. Preceded by the AGM at 5:30pm in the Auditorium in the Laboratory (New Science Block), followed by a drinks reception around the boat in the James Caird Hall at 6.15pm. Afterwards, Mr David Mearns will give a lecture in the Great Hall entitled: "In the Golden Age of Shipwreck hunting can Shackleton's ENDURANCE be found?" The lecture will be followed by Dinner in the Great Hall. David L. Mearns OAM, MSc is a chartered marine scientist, historical researcher, author, and expedition leader of deep ocean projects. He is one of the world's most experienced and successful deep-sea shipwreck hunters having located 24 major shipwrecks with an overall 89% success rate, and has been awarded four Guinness World Records, including one for locating the deepest shipwreck ever found at 5,762 metres. David's most important discoveries include Lucona- a cargo ship at the centre of a sensational European murder trial; Derbyshire- a bulk carrier lost with all hands which led to new rules covering the survivability and structural requirements for bulk carriers; HMS Hood- the famous British battlecruiser sunk in an apocalyptic battle with the German battleship Bismark; HSK Kormoran and HMAS Sydney- the combatants in a battle that led to their mutual destruction; AHS Centaur- an Australian hospital ship sunk by a Japanese submarine; and Esmeralda- a Portuguese East Indiaman in the 1502-1503 fleet of Vasco da Gama, which is the earliest colonial shipwreck ever found and excavated by archaeologists. Tickets are £50 each, to include a three course meal and wine. If you wish to attend the Dinner please email the Hon Sec, Dr Andrew Kinniburgh, by November 13th at the latest, at akinniburgh@f2s.com including in your email your full name, email address, the full name of any guest, whether you have any dietary requirements and your method of payment. Please pay by cheque (payable to The James Caird Society) and sent to Dr A. Kinniburgh, 43 Prideaux Road, Eastbourne, East Sussex, BN21 2NB. UK or by bank transfer to SORT CODE 12-01-03 and ACCOUNT NO 00447400, marking the transaction DINNER. If a £ Sterling payment is to be made to our bank (Bank of Scotland) from a bank outside the UK , you may need the following: BIC BOFSGB21254 and IBAN GB84 BOFS 1201 0300 4474 00. No tickets will be issued, but email confirmation of your reservation will be sent on receipt of your payment. There is plenty of parking at Dulwich College and there is a train every 30 minutes from Victoria Station to West Dulwich Station ( Orpington Line ) which is a 5 minute walk from the College. This is a charity dinner in aid of Challenge Antarctica. Friday-Monday, 26-29 October 2018. Athy, Ireland. Click here for the Autumn School brochure. 7.30pm - Official Opening in Athy Heritage Centre Museum. Exhibition 'Exploring Shackleton'—Exhibition developed by and held in conjunction with the Fram Museum telling Shackleton's story from cradle to grave. 4.30pm 'Icebreakers' A series of short presentations on topics relevant to the Shackleton Autumn School, presented by those with a passion for their subject. 8.30pm - Drama—'Shackleton's Carpenter.' One man play performed by Malcom Rennie. Probable Field Trip—Bus tour through Shackleton country. April 27 -August 28, 2018. Cost of admission: £14. 'We are delighted to be partnering with the British Library to bring a very special exhibition exploring the voyages of Captain James Cook. This landmark exhibition marks 250 years since Captain James Cook's ship Endeavour set sail from Plymouth and tells the story of Cook's three great voyages through original documents, many of which were products by the artists, scientists and seamen on board the ship. Cook's journal detailing the first crossing of the Antarctic Circle, handwritten log books, stunning artwork and intricate maps chart the voyages, which spanned more than a decade and explore the experiences of people on the ship and in the places visited. As a Friend of Antarctica we have great pleasure in inviting you and one guest to a special private view of the exhibition, exclusive to UKAHT. The private view on Thursday 10th May 2018, at 6.30pm will give you a unique opportunity to view the exhibition and meet the curators of the show. The evening will include refreshments and both British Library and UKAHT staff will be on hand to answer questions. If you would like to join us for this special occasion please click here. Or contact us at events@ukaht.org or 01223 355049. The exhibition will be open to the public from 27th April to the 28th August and there will be a programme of events to accompany the show including some with an Antarctic theme organised in collaboration with UKAHT. Please visit our website for more details, www.ukaht.org. I hope very much you will be able to join me, UKAHT's Trustees and other members of the UKAHT team for this very special evening. Presumably members of the UKAHT can attend this. Best to contact the Trust at events@ukaht.org or 01223 355049. The exhibit itself runs from April 27th to August 28, 2018. Cost of admission: £14. WHAT DOES THE ANTARCTIC MEAN? Wednesday May 9, 7pm. The world's most important natural laboratory? A fragile wilderness in need of protection? A place of strategic geopolitical importance? A major tourist destination? A place of great beauty and wonder and the world's last great wilderness, Antarctica has fired the public imagination for generations. But what is it about the Antarctic that matters so much? Jane Francis (Director of the British Antarctic Survey), Damon Stanwell-Smith (Executive Director of the International Association of Antarctica Tour Operators), Jane Rumble (Head of the Polar Regions at the Foreign and Commonwealth Office) and Klaus Dodds (Royal Holloway University of London) discuss why the Antarctic is so important to us today and what the future might be for the great white continent. Jane Francis is Director of the British Antarctic Survey, based in Cambridge. A geologist by training from the University of Southampton, she was a NERC Postdoctoral Fellow in London, palaeobotanist at the British Antarctic Survey, Australian Research Fellow at the University of Adelaide, a Royal Society Leverhulme Trust Senior Research Fellow and Professor of Palaeoclimatology at the University of Leeds, where she was also Dean of the Faculty of Environment. Her research interests include ancient climates and fossil plants from the Arctic and Antarctica, used to decipher ancient polar climates of the past. She was awarded the Polar Medal for her contribution to British polar research and was appointed as Dame Commander of the Order of St Michael and St George for services to UK polar science and diplomacy. Jane Rumble has been Head of Polar Regions Department at the Foreign and Commonwealth Office since January 2007, previously having spent 3 and a half years as Deputy Head. She started her civil service career in the Department of Environment, where she undertook a range of environmental and corporate policy roles, including on health and safety and genetically modified crops. In 2000, Jane moved to the cross-Whitehall Teenage Pregnancy Unit, as a local government and environmental adviser, taking on a broader spectrum of public health policy responsibilities as the Unit merged into the Department of Health. A geographer by background, she is a Fellow of the Royal Geographical Society. She merged her environmental and social policy interests in joining FCO to work on polar policy in 2003. She is the fourth Head of the FCO's polar brief since 1943. Damon Stanwell-Smith is the executive director of the International Association of Antarctica Tour Operators (IAATO), a membership organisation that works with over 95% of the private-sector entities who organise expeditionary and cruise tourism in the Antarctic / Southern Ocean. IAATO's mission is to ensure that all their members' operations are undertaken in as safe and environmentally responsible manner as possible, which includes coordinating the itineraries of all member vessels and working closely with both Antarctic Treaty Parties and National Antarctic Programmes. Prior to his IAATO appointment, Damon had a 25 year marine biology career, completing a PhD with the British Antarctic Survey, before working variously at an International NGO, private sector consultancies and six years at the UN-Environment World Conservation Monitoring Centre, where he led their marine programme. Klaus Dodds is Professor of Geopolitics at Royal Holloway University of London and a Fellow of the Academy of Social Sciences. He is author of a number of books with the latest being Ice: Nature and Culture (Reaktion/University of Chicago Press 2018). Commemoration of the 150th anniversary of Captain Scott's Birth in Plymouth. Booking: Download the Booking Form for the events on 6 June 2018 here. For further details please contact the Vice Chairman and Secretary of DCPS Julie Ellis: 01752 767753. Note: St Bartholomews Church was built in 1958 on the site of Outlands House, the boyhood home of Robert Falcon Scott. January 25 - March 31, 2018. UNH Museum (Dimond Library) and the UNH Museum of Art (Paul Creative Arts Center), University of New Hampshire, Durham. NH. Click here for some photos of the exhibit at the Museum. Click here for a pdf of the talk I gave, ostensibly on Some Antarctic Explorers and their Books, on February 15, 2018. Talk: Thursday, 23 November 2017, 7pm, at St George's Hospital, Blackshaw Road, Tooting, London, SW17 0QT, in the Monckton Lecture Theatre, Ground Floor, Grosvenor Wing. Exhibition: Hyde Park Room, First Floor, Lanesborough Wing, on Friday 24th November from 1-5pm and on Saturday and Sunday 25th-26th November from 10am-4pm. Entry to the Exhibition is free. Live Arts at St George's Hospital, along with the Archives of St George's, University of London are hosting an exhibition of photographs, documents and illustrations relating to St George's alumnus, Edward Adrian Wilson. Dr Edward Wilson, who trained at St George's Hospital, was the Assistant Surgeon and Zoologist on the Discovery Expedition, and Chief Scientist on the Terra Nova. Wilson, along with Captain Scott, perished on the return journey from the South Pole in 1912. Some of the material displayed has never been seen in public before. Accompanying the exhibition there will be talks by Dr David Wilson, great nephew of Edward Wilson, and Anne Strathie, Polar Historian, as well as a display of thematic art of the Antarctic. The opening event takes place on Thursday 23 November 2017 at 7pm at St George's Hospital, Blackshaw Road, Tooting, London, SW17 0QT, in the Monckton Lecture Theatre, Ground Floor, Grosvenor Wing. The Exhibition will also be open in the Hyde Park Room, First Floor, Lanesborough Wing, on Friday 24th November from 1-5pm and on Saturday and Sunday 25th-26th November from 10am-4pm. Entry to the Exhibition is free. Friday, 17 November 2017, 6pm, Great Hall, Dulwich College, London. Preceded by the AGM at 5:30pm in the South Cloister. Dinner will be served at 7pm in the Great Hall. Friday-Monday, 27-30 October 2017. Athy, Ireland. 8.00pm - Book Launch. In association with the publishers, the South Australian Museum, the school is delighted to host the launch of Shackleton's British Antarctic Expedition 1907-1909. This unique publication gives real depth to the stereo photographs drawn from the Douglas Mawson collection and a remarkable insight into Shackleton's Nimrod expedition. Ushering in the Age of Mechanical Exploration: Richard E. Byrd's First and Second Expeditions to Antarctica. The exhibition text was developed by the Byrd Polar Research Center and is complemented by artefacts from the Center's own and private collections. 3:30pm - Film: Byrd 1933. 8.30pm - Drama - Athy Church of Ireland Community Centre. Tom Crean Antarctic Explorer. Tom Crean (1877-1938) the intrepid Antarctic explorer and one of Ireland's unsung heroes is brought to life in this dramatic and humorous solo performance by Aidan Dooley. A welcome return to the Shackleton School for this iconic show. Bob Burton is a natural history writer who has been involved with South Georgia for many years. He visited the island for the first time in 1964 and returned in 1971 to study albatrosses and fur seals. From 1995 to 1998, he was director of the museum at Grytviken and started to collect information on the island's history. This included researching the time that Shackleton spent on South Georgia. Bob now visits annually as a lecturer on cruise ships. Her Excellency Else Berit Eikeland is the Norwegian Ambassador to Ireland, having taken up office in September 2016. Her career in the Norwegian Foreign Service has spanned administrative, policy and ambassadorial roles, with postings to the Philippines, San Francisco, London and Canada. Prior to arriving in Ireland, she was the Polar Ambassador for the Arctic and Antarctica where she represented Norway's considerable interests in these regions. The Shackleton Autumn School has built strong relations with Norway over the years and Ambassador Eikeland is keen to further develop these and more general Norway/Ireland relations based on the many areas of common interest. A polar researcher, writer, and speaker, Joe O'Farrell is a member of numerous polar societies and associations. He has contributed to many journals, and lectured extensively on the historical narrative of both Arctic and Antarctic exploration and discovery. He has been to Antarctica, including Elephant Island and South Georgia, and, in furtherance of one of his other areas of significant interest and study, has twice visited the remote South Atlantic island of Tristan da Cunha. Recently retired from a career in insurance, Joe lives and works in his home in Enniskerry, County Wicklow. John is the Chief Executive Officer of The Royal Canadian Geographical Society. He is the international bestselling author of seven books, including Frozen In Time: The Fate of the Franklin Expedition, The Third Man Factor: Surviving the Impossible, and most recently Franklin's Lost Ship: The Historic of HMS Erebus. His work has been translated into fourteen languages. He has appeared on many television and radio programs, and has been featured in major documentary films including 'Arctic Ghost Ship' on PBS Nova, 'The Angel Effect' on National Geographic Channel's Explorer, and 'Flicker' on Bravo. He is the former chair of the Editorial Board of The Globe and Mail newspaper. In 2015 John received the Polar Medal. Brad's interest in polar history started when he picked up an Antarctic exploration book at the local Public Library at the age of eight years old. He has a graduate degree in Decision Sciences from the University of Pennsylvania and has a fascination in how people and businesses can make better decisions. He is based in London. David a Californian native, is an author, historian and small business owner. He has written a three-part polar biography of the Irish explorer Tom Crean, a key player in Scott's and Shackleton's expeditions. The final book of this series, Antarctic Voyager, was launched at the SouthPole-sium conference in Scotland (May 2015). David's book, Sailor on Ice: Tom Crean with Scott in the Antarctic, has been optioned for a documentary. In November 2016, Enda O'Coineen crossed the starting line on the Vendee Globe challenge, becoming the first Irish person to take part in this gruelling single handed round the world race. Two months later, a squall in the Southern Ocean dismasted his yacht 'Kilcullen Voyager,' leaving him to limp into Dunedin on New Zealand's South Island. Enda's early life was a combination of youthful rebelliousness, sailing, budding entrepreneurship and hard work, with a BComm from NUI Galway along the way. Soon after, he attempted an Atlantic crossing in a rubber dinghy. He capsized 300 miles short of the west coast of Ireland—a few years later he completed the trip for a world first. As well as a serious commitment to charitable activities, and in particular the Atlantic youth trust Enda is executive chairman of Kilcullen Kapital Partners with interests in a range of businesses worldwide. Shane (in his own words) can do nearly anything except elementary math equations and simple plumbing projects at his home near Sedona, Arizona. He has led 130 Grand Canyon river trips, authored several river guidebooks, and recently completed a biography of an historic Arizona character named John Hance, "the greatest liar on earth" according to Teddy Roosevelt. Since 2008, Murphy has lectured on polar history and driven Zodiacs around Greenland, Arctic Canada, the North Pole and Antarctica. He has transcribed several Endurance diaries and traveled widely in search of expedition images. From the U.K., but South Australia-based, he curated Douglas Mawson's personal Collection, initially at Adelaide University. Collaborations with the South Australian Museum led to Mawson-related exhibitions (1995, 1996, 2001-17, 2009-11), and both the Collection and its curator founded the Museum's Mawson Centre. Since 2003 his senior managerial role widened when he established an Australian Polar Collection, adding Wilkins and Rymill material. Mark has written widely on Mawson, editing a CD-Rom, the Adelie Blizzard facsimile, and recently a stereoscopic book. He was coordinator of the 2014's centenary Aurora Symposium; lecturer/guide/marshal on Antarctic cruises, and 500m bicycle Outback Odysseys; also numerous smaller trips, one camel-supported. Laura Kissel is the Polar Curator for the Byrd Polar and Climate Research Center Archival Program (Polar Archives), a position she has held since 1996. She has a bachelor's degree from The Ohio State University and a master's degree from Kent State University (Ohio). While the Polar Archives holds hundreds of collections, the cornerstone of the repository is the Papers of Admiral Richard E. Byrd. Laura's primary responsibilities include assisting the many researchers and scholars who use the collections, as well as donor relations, exhibitions, and other education and outreach activities. Anne is a Research Librarian/Curator at the Section for Private archives, National Library of Norway in Oslo. She is an Ethnologist & cultural historian and was awarded a Master's of Art from the University of Oslo in 2000. Since 2001 she has been a permanent employee at the National Library of Norway, where for the last 10 years she have been responsible for archives connected to polar history. Bob is a senior research associate of the Scott Polar Research Institute of the University of Cambridge. He specialises in the history and geography of both polar regions. His work with the Antarctic Heritage Trust involves the preservation of the historical huts and other aspects associated with the exploration of the discovery of the Antarctic. His most recent publication is A Chronology of Antarctic Exploration. From Galway, Aidan trained at Guildford School of Acting London and works as a freelance Actor, Writer and Director in London. Highlights include 'Philadelphia Here I Come' Wyndhams Theatre London. 'Elegies for Angels' Criterion Theatre London. 'DA' White Bear Theatre London. 'Players and Painted Stage', 'Last Apache Reunion' SOS Theatre Bristol. National Tours of 'Tales of the Lost Formicans', 'Julius Ceasar' and 'Romeo and Juliet' Bristol Old Vic Theatre Company. He worked for many years developing various performance pieces and historical characters for all the National Museums in England including the National Maritime Museum Greenwich where the idea of a story on Tom Crean originated. He has won the prestigious Fringe First at Edinburgh and the Best Solo Performance award winner at the New York International Fringe Festival. Saturday, 9 September 2017, 2-7pm. Discovery Point, Dundee, Scotland. This half-day event will explore William's life through his letters, diaries, and the writings of other explorers on Captain Scott's expeditions. It has been arranged in partnership with the Dundee Heritage Trust and Discovery Point. Dundee is where the RRS Discovery, on which William sailed with Captain Scott on his first expedition, was built and, in recent years, fully restored. The day will include a presentation based on several years of research, including William's letters and Antarctic diaries, by George and Valerie Skinner, authors of The Life and Adventures of William Lashly. There will also be an opportunity to see and learn about original artefacts held by the Dundee Heritage Trust relating to William including his kit bag and the inscribed Book of Prayer he gave to his wife-to-be, Alice Cox. Time has been built into the event to allow participants to explore the Discovery Point's award-winning, family- friendly exhibition centre about polar exploration. If you are a relative of William Lashly there will be plenty of opportunities to meet up with other family members. There will be a full guided tour of the ship, when it will be possible to see where William plied his trade as stoker for 10 months at sea on the round trip to the Antarctic, and where he lived with the other expedition members for two years, locked in the Antarctic ice. The afternoon will finish with a private drinks and canap� reception on the deck of the Discovery. The charge for attendance at the half day event is �30. This includes the presentations, entrance and full access to the award-winning Discovery Point Exhibition Centre, a private drinks reception and guided tour of the ship, and a signed copy of the new, revised edition of The Life and Adventures of William Lashly. For those wishing to stay overnight there are several hotels within walking distance of the venue. 2.15 Stoker William Lashly. Illustrated talk by George and Valerie Skinner, authors of i>The Life and Adventures of William Lashly. 3.30	Discovery Point and its resources with particular reference to William Lashly. Louisa Attaheri, Curator, Dundee Heritage Trust. 4.00	Free for viewing William Lashly display and individual visits to the Centre exhibitions. 5.30	Guided Tour of RRS Discovery. 6.30	Private Reception, with drinks and canapés on the deck of RRS Discovery. Contributors: Valerie Skinner, who is William Lashly's first cousin (3 times removed) was a Primary School Headteacher. Her husband, George, was a researcher and teacher at the University of Manchester. Both have visited the Antarctic and in retirement have been researching the life of William through his letters, diaries and other historical records. They run a website about him and give talks to schools and groups. Louisa Attaheri is Curator for the Dundee Heritage Trust's collection and has a particular interest in the contributions made by the ordinary crew members of Scott's expeditions. William Lashly was born into a Hambledon farming family on Christmas Day, 1867. At the age of 21, he decided to join the Royal Navy as a stoker. He was an exemplary seaman and in June 1901 was invited to join the crew of the Discovery for Captain Scott's first expedition to Antarctica. He proved to be a strong and courageous Antarctic explorer and on one occasion was responsible for saving Captain Scott's life. When in 1910 Captain Scott set sail on the Terra Nova for his second Antarctic expedition he took William with him. In October Scott set off to try to get to the South Pole. William was part of his support team and was the last person to see Scott and his four companions alive when they made their final attempt to reach the pole. During their return journey to Base Camp, William and Tom Crean risked their lives to save their leader Lt. Evans, for which act of bravery they were awarded the Albert Medal by George V on their return to Britain. Friday-Sunday, 12-14 May 2017, Oslo, Norway. See the webpage on this site. Friday, 5 May 2017, 6pm, Great Hall, Dulwich College, London. "ERNEST SHACKLETON LOVES ME is the epic musical adventure starring GrooveLily's fierce and funny electro-violinist Valerie Vigoda (Striking 12), and the courageous and charismatic Wade McCollum (Priscilla Queen of the Desert). This innovative, high-tech adventure tells the story of a sleep-deprived single mom who struggles to work as a video game music composer. Unexpectedly, she is contacted across time by the famous polar explorer, Ernest Shackleton. Inspired by her music, he shares his epic Antarctic journey with her in video and song. Against all odds, they discover that their greatest inspiration lies within each other. Directed by Obie Award winner Lisa Peterson and written by Tony Award winner Joe DiPietro (Memphis), with music composed by Brendan Milburn and lyrics by Valerie Vigoda, ERNEST SHACKLETON LOVES ME features production design by Alexander V. Nichols (Nice Work If You Can Get It), costume design by Chelsea Cook and sound design and original compositions by Tony Award winner Rob Kaplowitz (Fela!). ERNEST SHACKLETON LOVE ME was originally co-commissioned by Theatre Works and La Jolla Playhouse." I saw this when it played at the Paramount in Boston in 2015. Lots of fun! Friday 24 - Sunday 26 March 2017, National Museum of the Royal New Zealand Navy, Torpedo Bat, Devonport, Auckland, NZ. Saturday: 9am-4pm. Conference Sessons. 4-6 Social Gathering, Navy Wardroom. Sunday: 10am. Commemorative Service, Navy Chapel, followed by tour of the Devonport Navy Base. Afternoon: Conference Sessions and final Social Gathering at Navy Museum. "Tasked with laying supply depots for Shackleton moving towards them, the party was unaware that Endurance had been crushed in sea ice. The depots were set up in spite of many setbacks, including the loss of their ship." Soloist: Matthew Pollard, Rector of Bridlington Priory. Pianist: Katie Colbrook. "These are the original songs composed by the members of the crew of the 'SY Mlorning' captained by RYYC member William Colbeck. 'Morning' was sent to the Antarctic to rescue [sic] Scott's 1901-1904 'Discovery' expedition." Tuesday, 28 February - Saturday, 11 March 2017. Blue Raincoat Theatre Company. Project Arts Centre, 39 East Essex Street, Temple Bar, Dublin. Tickets: €16-20. "The Blue Raincoat Theatre Company will bring their Sligo sell-out production 'Shackleton' to Dublin next week for 14 performances. I'm particularly excited by the production and am hoping that Dublin will be a sell out for them too—2,800 seats to be sold! Last Saturday's Irish Times front page included an image from the play. They are giving us a 20% discount on tickets purchased on or before next Tuesday 28th February. The show then moves on to Scotland and hopefully we might be in a position to host it locally in County Kildare at some stage." See information in 'Athy News'.